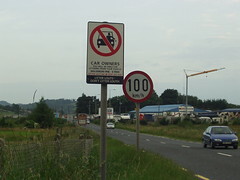 Eire N1 Northern Terminus – UK A1 Southern Terminus. I don’t know much about Ireland, I’m afraid. However, the Brexiters seem to understand even less, and that worries me. On the one hand prominent pro-Brexit ministers such as David Davis state they don’t want a hard border post Brexit, but on the other hand the very same people are in favour of a hard Brexit, whereby the UK (incl. Northern Ireland) will leave the Internal Market, incl. the free movement of people and the common customs area. Something doesn’t add up here! Firstly, if for instance the UK wants to control the number of Poles entering the country, how does that work if they can freely travel to Ireland as EU citizens and then get the bus to Belfast, unless there is a hard border? Perhaps the Brexiters will reply they don’t want to ban Poles from traveling to the UK at all, but that they just want to control the numbers moving here permanently. Fair enough, but that requires a much more thorough system of work permits than what is being discussed at the moment. Different from what they promised during the Brexit referendum, they effectively wouldn’t really control the border, but instead keep a tab on people once they’re here. I don’t have a problem with that, but they should tell us if that’s the plan. Secondly, if the UK and Ireland aren’t in the same customs area, surely lorries can’t just drive across the border. Even if the UK didn’t care about EU products getting smuggled freely across the Irish border, I have a feeling the EU would have a problem with UK products getting through without import duties. In other words, even if you don’t need to show your passport, you’ll get your luggage checked. Thirdly, almost all EU countries are part of Schengen, the passport-free zone. The UK and Ireland have so far refused to join, but it’ll become much harder for Ireland not to do so when the UK isn’t an EU member state any longer. If at some point in the future Ireland joins Schengen, a border becomes almost unavoidable unless the UK joins Schengen too (like Norway and Iceland). The Brexiters often say that the UK and Ireland also had an open border before we joined the EU, which is true, of course. What they forget is the Ireland wasn’t an EU member either at that point. This will be the first time ever that the EU’s external border will divide the Emerald Isle. Stating that you don’t want to create a hard border is simply not good enough when you’re simultaneously campaigning for a hard Brexit. I think that the UK was an EU member before Ireland so the EU’s external border did divide the Emerald Isle. Sorry, but no – The UK, the Republic of Ireland and Denmark all joined the EEC (as it was called back then) on the same day: 1st of January 1973.